Have you seen our Baby Bear stamp yet??? It is absolutely ADORABLE! I knew as soon as I saw this stamp back in April at our On Stage event that he would be one of the sets that made my first order from the new catty! And he did, and then he sat there…until the new CTC blog hop focusing on babies and kids! I have a friend who has recently had a little boy, so this set was going to be perfect to get its first use. I used the catty for some inspiration. I loved the brown bear on the blue background on page 61 – so he helped inspire this creation. Isn’t he adorable. And so versatile – girls, weddings, gift cards, you name it, he could be used. And because this is a triple step stamp, the colour combinations are endless. My best tip for lining him up when stamping is to focus on his bottom and the gaps under his arms. That generally sets you right! And if you are wondering about that background…it’s one of the papers from the serene scenery stack that I used in my previous post! I did use our recently retired Little Letters for the name – but they fit too well not to! I hope you enjoy playing with this stamp set! So yes – I am playing along with ANOTHER global design challenge. This week it’s a colour challenge. But I HAD to play along, because this colour challenge includes all of my favourite in colours from this year. I use the colours together in my cards quite a bit, so it was easy to play along this time as far as the colour combination went. Unfortunately, I had to create a sympathy card for some relatives overseas. Thats not such an easy task, and my least favourite kind to make. So I pulled out our Best Thoughts Stamp set for this challenge. I like to keep my Sympathy cards fairly neat and clean. So I used some simple layers with card and designer paper for the base and then stamped three of the flower images and heat embossed them with white embossing powder. I then coloured them using Watermelon Wonder Ink and an aqua painter. Cut out layers, then layer them up with some dimensionals. Now I know my card is for a sympathy card, but you could use this any other occasion too. And I am on a Christmas Roll – so why stop now! This card was fun and fiddly to make. A vellum bauble that was stitched on the machine. It has a tree from the perfect pines framelits and then filled with glitter and sequins. 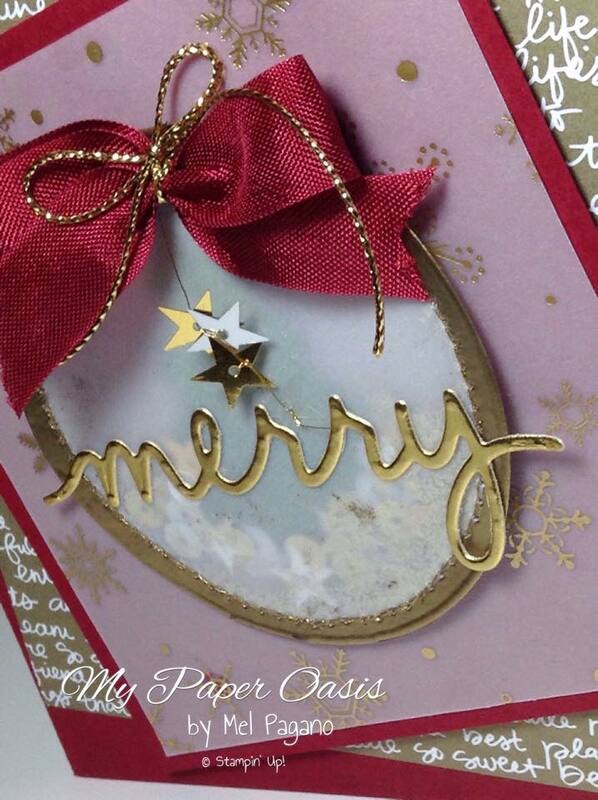 I then used versa mark around the edges and dipped in Gold embossing powder and gently heated it. Cherry cobbler cardstock and ribbon and gold, gold and more gold! I just tied a few stars together with the gold metallic thread – its so thin so it makes it so versatile. Christmas isn’t far away now so I’m off to build my stash! It’s the first of our Pennsationals Team Monthly Hops and what fun we are starting with! Its a colour challenge. And not a simple colour challenge – but one that really got the creative juices flowing! You may have come from the wonderful Tracy Penn or be starting here – either way I hope you hop around and see all the fantastic inspiration everyone has for you. I have really come to love playing along with design challenges. I find they really help spur your creativity and get you thinking outside the box. Take for example this colour challenge. 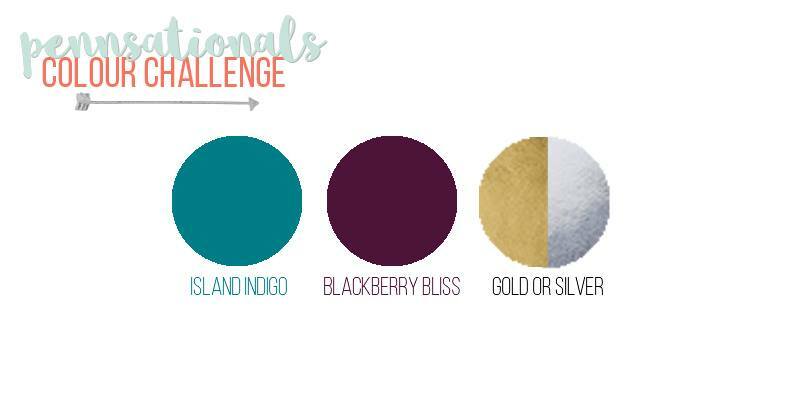 I would usually never put Blackberry Bliss and Island Indigo together – so that really had to get me thinking how I would use those colours and what my theme would be. I haven’t really done too many Christmas Cards yet – so I thought this would be as good a time as any to start! So here’s what I came up with…. And of course the inside had to have some silver embossing too! I simply brayered a piece of Whisper White Cardstock with both colours. Staring at either edge every time I laid down colour, to give it a graduating depth of colour. I love the effect – don’t you! Silver was the only option to choose to set this card off and I have wanted to use this gorgeous stamp from the Embellished Ornaments Stamp Set ever since I first saw it. The one thing that never ceases to amaze me is the absolute quality of our Stampin Up embossing powders. They leave such an amazing smooth and clear image. A few more embossed stars from the Jingle All The Way set and I was done. We will be making a version of this card at an upcoming class next week – It’s beginning to look a lot like christmas – contact me if you would like to join the fun! I really hope you like it and enjoy hopping around with the rest of the team. Next stop is on to the lovely Jess at My Paper Caper. Her work is always inspiring so make sure you hop across by clicking the button 🙂 There’s a full list at the bottom in case you get lost along the way. I am pretty excited today. I thought i would have a go and play along in the FIRST EVER Global Design Project #001. I have never played along in one of these, so I decided today was the day! The challenge for this project is a colour challenge using smokey slate, pink pirouette and so saffron. These are very soft, subtle colours, so I wanted to do a clean and ‘gentle’ card to match. 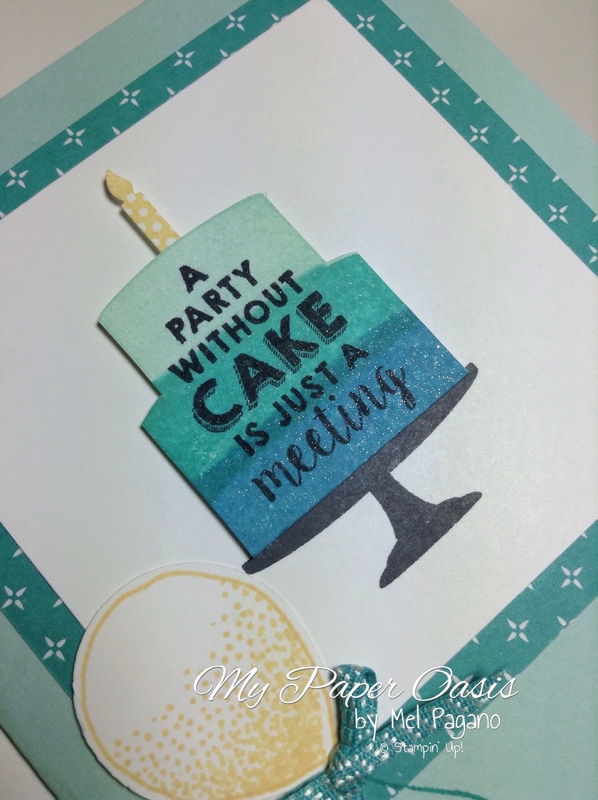 I used a few different stamp sets for this card – but the feature is the Sprinkles of Life Stamp set and punch. I don’t have the Watercolour Wash background stamp yet – it’s coming in my next order – so to substitute, I coloured my large clear block with the pink pirouette stampin marker and then spritzed it with water before I used the block as my stamp. The clouds are inked in versa mark, then in smokey slate then heat embossed with our iridescent ice embossing powder. The rain drops i punched out of vellum and used my glue pen and dazzling diamonds glitter to apply a bit of sparkle. It’s quite pretty in real life!